*New Patent EZ Folding-Lid Pail-Allow you greater leeway! Easy to open, easy to use, easy to close! All PAILKING plastic pails/containers are made of F.D.A. approved strong and durable Polypropylene (PP) or High Density Polyethylene (HDPE) resin. *Ideal for the paint, lubricant, ink, dairy products, food, chemical, dyeing, powder, glue, detergent and more. Functional and cost-effective, our high quality pails are your best choice. Injection molded in one piece with reinforced ribs for extra strength. No metal parts means rustproof and long life. Lightweight, long wearing and reusable. No seams and won't dent. 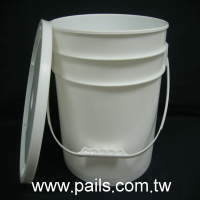 Empty pail nest for low-cost stacking and shipping. Comply with International Transportation codes.